Acupuncture is a component of traditional Chinese medicine that originated in China over 5,000 years ago. It is based on the belief that living beings have a vital energy, called "Qi", that circulates through twelve invisible energy lines known as meridians on the body. What is a typical Acupuncture Treatment? Before the initial appointment, clients usually complete a health history questionnaire. The acupuncturist then interviews the client, asking about his or her primary health concern, lifestyle habits, diet, emotions, menstrual cycle, sleep, temperature, appetite, stress, and sensitivity to foods, temperature, and seasons. During the interview, the acupuncturist examines the client carefully, noting his or her face color, voice, and tongue colour and coating. There are also three pulse points at the wrist of each hand that the acupuncturist will assess to further determine the health of the 12 meridians. After the interview, the acupuncturist gives a diagnosis and begins treatment. 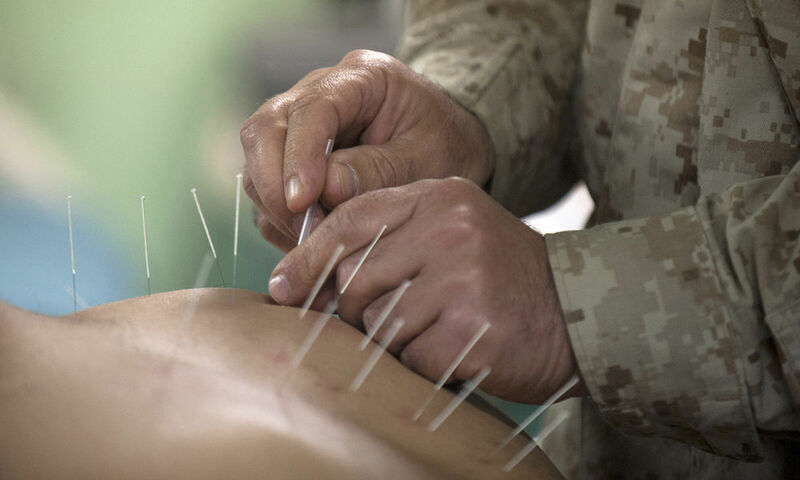 Typically, the acupuncturist will use 6-12 needles during the treatment. The number of needles used does not correspond with the intensity of the treatment, rather it is the precise placement of the needles that is important. Upon insertion, the client may feel a slight sting or prick. Once the needle is inserted, there should be no pain. You should feel comfortable during the treatment. If you experience pain, numbness, or discomfort, notify the acupuncturist immediately. Acupuncture with manual stimulation: Acupuncturist manually moves the needles after inserted to accomplish a desired effect. Electrostimulation - provides electrical stimulation to two to four acupuncture needles. Can be used for pain relief and muscle pain. Moxibustion: heating of acupuncture needles with dried herb sticks to activate & warm the acupuncture point. Herbal medicine: Chinese herbs may be given in the form of teas, pills, and capsules to supplement acupuncture treatment. Gymnast get's Acupuncture to help heal broken toe.